In spite of widespread willful denial and ignorance of reality, sport and politics are inextricably and intimately tied together. Perhaps in no other sphere is this more obvious than in the relationship between authoritarianism and football. Authoritarian dictators – on both extremes of the left/right spectrum – have often used football as a political tool to garner support for their regimes or to demonstrate their superiority over their geopolitical rivals. The impact of authoritarianism on football was at its peak during the Cold War, when in the absence of actual fighting the football pitch became the arena on which ideological foes faced off. In this section, Café Futebol explores the dynamics of the shared space in which both football and authoritarianism existed, from Salazar to Shcherbytsky, from the Argentinian military junta to the Soviet Ministry of the Interior. The eventual appearance of a universal European club competition to define the best club side on the continent was, to some degree, inevitable. 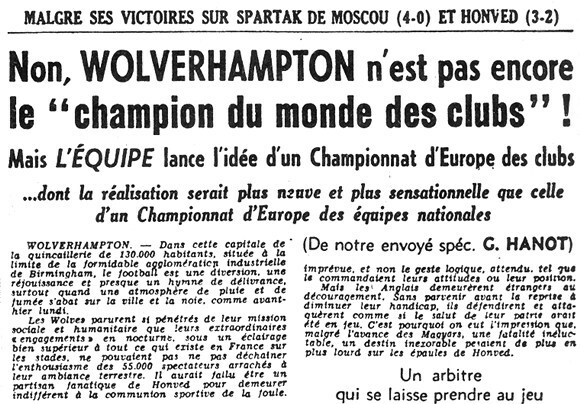 One game that is often said to have precipitated its emergence took place on 13th December 1954 when Stan Cullis led his direct, well-drilled Wolverhampton Wanderers side to a victory that would have various repercussions. 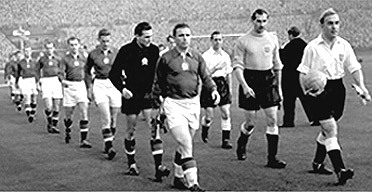 From a Western European perspective, the Hungarian ‘golden team’ of the 1950s can seem to stand outside of history. Exotic and flamboyant, they appeared from behind the iron curtain during the darkest days of Stalinist and post-Stalinist repression, playing football that celebrated the skill of the individual and affirmed a joie de vivre that few, if any, sides have since been able to match. Following the Soviet invasion of Hungary in 1956, the side ceased to exist as suddenly as it had arrived.